Description: Gloveleya Kids Plush Backpack Toddler Diaper Bags Kindergarten Bag For Little Children(12-36M)-- Red Strawberry Size: 7.5*4*9 inches in length*width*height Shipping Weight: 5.6 ounces Made of high quality soft plush and zipper accessories, suitable for baby, kids bewteen 1-3 years old. 2 roomy compartment in the backpack,enough space for kids to keep lunch, fruit, snacks or drinks, or even can be used as a daper bag. The backpack design in a special style, 2 adjustable strapes , it's easy for children to carry or snuggle. The playful backpack with Red Strawberry is ideal for kids going to stroll, playing in the park, going to the kindergarden and other outdoor activities. 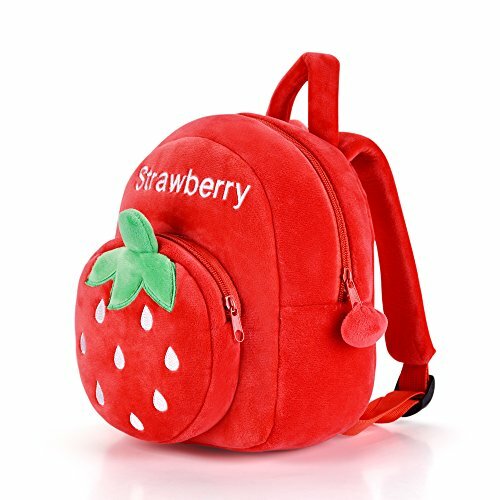 LIGHT WEIGHT,BRIGHT COLORS - This cute toddler strawberry backpack is made of high quality plush and 2 zipper accessories. Could be washed. LARGE CAPACITY - There is 2 roomy compartment in the backpack.Plenty of space in the backpack to store your kids's toys, books, snacks and more.Perfect Size: L7.5x W4 x H9 inches, just right for Little Children(Ages 12-36M). UNIQUE DESIGN - Super cute cartoon strawberry design, durable, stylish appearance, colorful. Not only can be used as a backpack, but also a child's toys. Suitable for many occasions, like a trip to the zoo, playing at the park and other outdoor activities. ADJUSTABLE COMFORTABLE STRAPS - 2 adjustable shoulder straps and a top handle for easy carrying or snuggling. The padded shoulder straps are also adjustable, making them comfy for little shoulders. BEST SCHOOL SEASON GIFTS - Suitable for baby, kids under 3 years old.Enough space for children's things, like toys, foods, fruits,small books,pencil bags and other stationery etc.Whether they are heading off to school, or going on their first big adventure, your little one will love carrying their very own backpack.